After a long drive from Blythe, through the desert of Arizona, I arrived at the airfield of Avra Valley. Things have changed since I was here last, during the early 1990s! The airport is now officially named Marana Northwest Regional Airport. There was a building which resembled a small terminal, but I drove past there, past a salvage business (2 A-4 Skyhawks in their yard if I remember correctly), past the threshold of runway 03 and took a right turn towards the Marana Skydiving building. I remembered that the aircraft I was looking for were parked nearby. But somewhere during the past 12 years or so a fence has been erected and I found my way blocked! No one present at the para club, either. There was a gate with a sign ATW Aviation and I called the number a few times: voicemail. I tried again the next day, 16May08, and after some confused formalities with the FBO/Airport Authority someone of ATW Aviation met me at the gate and escorted me in. Follow me! At first I did not realise ATW Aviation, the people who let me in, had no business with the large radial-engined transports I had actually come for... But I found ATW Aviation had some interesting aircraft on their ramp too, predominantly Douglas A-4 Skyhawks in various stages of undress! One radial-engined 'propliner' with ATW Aviation was this Grumman HU-16B Albatross N85303. Its one time US Air Force serial was 51-5303 (c/n G-186). It was owned by Robert Carlson of East Walpole (Maine) during 1995-2003, but was registered on 03Nov04 to Surf Wing Inc. of Laguna Beach,CA and apparently a new tailnumber has been reserved for it: N7773B. 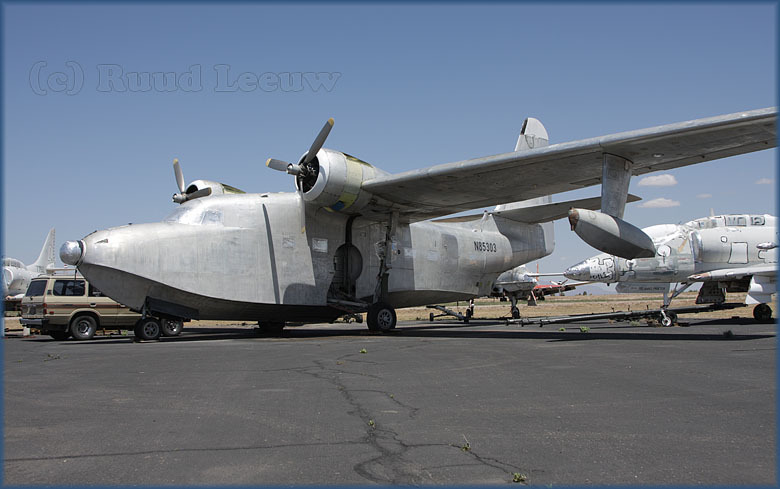 The Grumman HU-16 Albatross is a large twin-radial engine amphibious flying boat. Originally designated SA-16, it was renamed HU-16 in 1962. The Albatross was designed to be able to land at sea in open ocean situations in order to effect the rescue of downed pilots. Its deep-V cross-section and substantial length helped make it possible for it to land in wavy conditions. Since it weighs over 12,500 pounds, pilots must have a type rating in order to act as pilot or co-pilot on board the Albatross. There is a yearly Albatross fly-in at Boulder City, Nevada, where Albatross pilots can renew their type ratings. 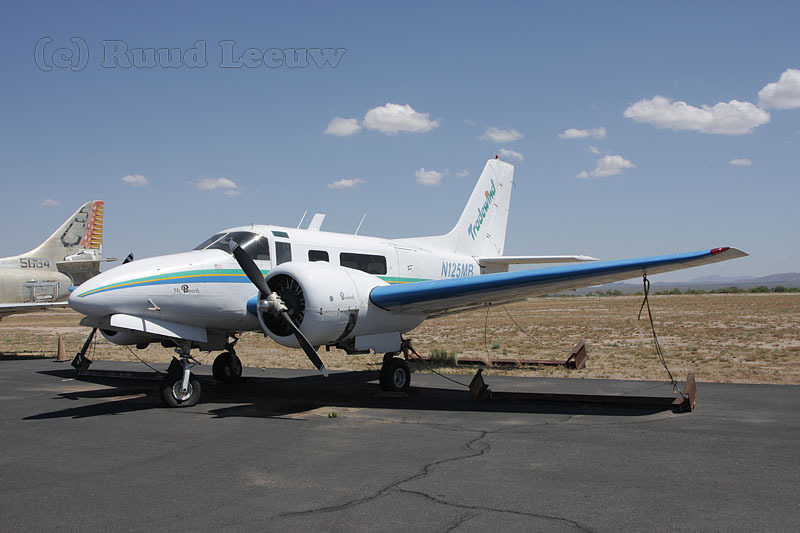 "A Tradewind is a converted Beech 18, though on first look doesn't give it the nice impression of the 18... According to the FAA N125MB is a Beech C-45H with serial AF-286 (manufactured in 1942. Its certification as a Turbo-Prop engined aircraft seems strange as the round engines seem obvious." It was registered (Certificate Issue Date) on 26Sep97 to Clifford A Smith of Titusville,FL. In 1960, the Volitan and Parigon Corporations joined forces to form Volpar Inc. Volpar went into the business of converting standard Beech 18's to tricycle gear versions. Their conversion was successful and Beechcraft itself began installing tricycle gear based on the Volpar design. Volpar also began retrofitting various engines to the Beech and later versions included the Volpar "Super 18" and the "Turboliner", both of which were powered by 500 - 750hp Garret Turbine engines. The tricycle gear conversion to the Model 18 gave the aircraft significantly better ground handling characteristics. Because the aircraft was now close to its in-flight attitude while sitting on the ground, a new doorway with integrated stairs was made to assist ingress and egress. It also meant greater passenger comfort while boarding and during ground maneuvers as the aircraft's floor was no longer on an incline, but level with the ground. Volpar and Beechcraft modified other aspects of the aircraft as well. Improvements included such touches as increasing the head room by raising the headliner, adding "picture glass" windows and making the windscreen more upright. Its nose was also further lengthened to accommodate the new nose gear. 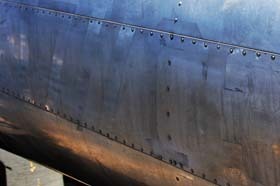 All of these changes succeeded in extending the life and usability of the aircraft. Through the Beech 18 forum I received following additional information: "The Tradewind was a single tailed conversion done by PAC, Pacific Aeromotive Corporation. They used a horizontal stabilizer to create the vertical fin. It also had tri gear. Only a few were made. The tail mod didn't do much for the airplane but add a lot of weight as the structure had to be beefed up considerably. Beech wasnt involved." I was called inside by an engineer, to have a look in the hangar and to my surprise two Battle of Britain warbirds were in maintenance here! Whatever I suspected to see here, certainly not a Supermarine Spitfire and a Hawker Hurricane! 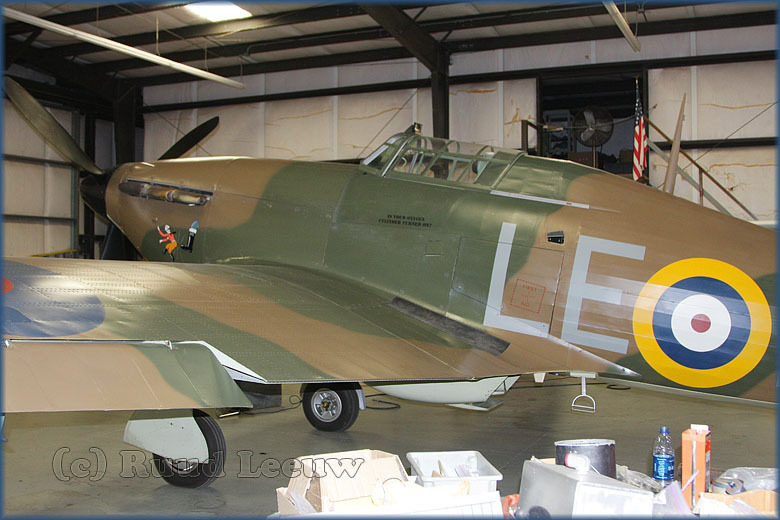 Vickers/Supermarine Spitfire NX2TF (serial 6S-730116) was registered on 12Dec01 to Chino Spitfire LLC of Houston,TX. It was manufactured in 1944. The Spitfire will always be compared to its main adversary, the Messerschmitt Bf 109: both were among the finest fighters of their day and followed similar design philosophies of marrying a small, streamlined airframe to a powerful liquid-cooled inline engine. NX33TF is a 1941 Hawker Hurricane with serial CCF/41H/8020. Its manufacturer's name is the Canadian Car & Foundry (CC&F), more familiarly known as "Can Car", which manufactured busses, railroad rolling stock and later aircraft for the Canadian market. CC&F's history goes back to 1897, but the main company was established in 1909 from an amalgamation of several companies and later became part of Hawker Siddeley Canada (through the purchase of Avro Canada in the late 1950s). By 1939, with war on the horizon, Canadian Car & Foundry and its Chief Engineer, Elsie MacGill, were contracted by the RAF to produce the Hawker Hurricane. Refinements introduced by MacGill on the Hurricane included skis and de-icing controls for operating in the winter. MacGill's success with the Hurricane earned her the nickname: "Queen of the Hurricanes". 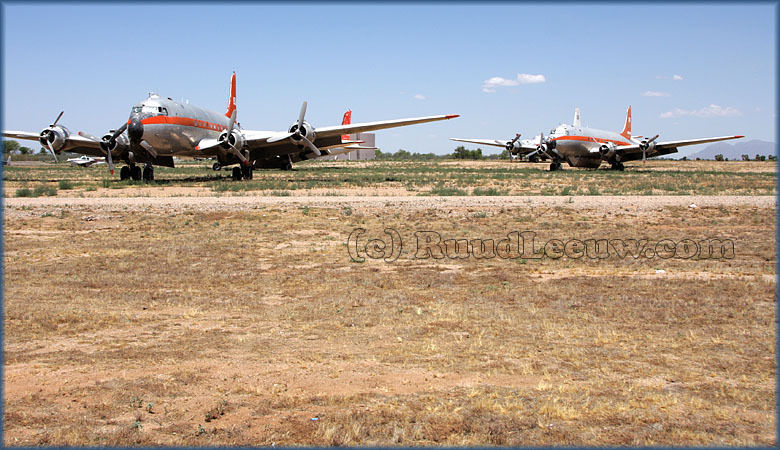 N67034 (former Tanker 150) is a Douglas C-54D (c/n 22202/654) and has been stored here for over 10 years. 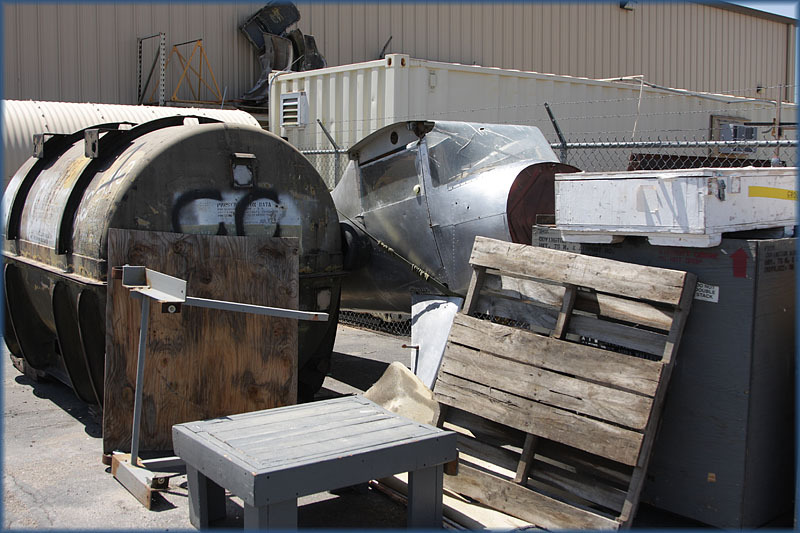 On 31Jul03 it was registered to Maricopa Aircraft Inc. of Tucson,AZ, having purchased it from Central Air Services. C/n 22202 was delivered to US Army Air Force on 05Oct45 as 43-17252, transferred to the US Navy that same date, serial 56548 and converted to C-54Q. At some point it was transferred to the US Marine Corps. In March 1966 its military career ended with storage in the MASDC / Davis Monthan AFB (Arizona). Texas Truck Salvage Company bought it in 1975 and sold it to Robert B. Audiss Jr on 03Apr75, registering it as N67034. Central Air Services bought it on 11Oct76 during which career it earned its airtanker 150 markings. Maricopa Aircraft Services bought it on 18Jun2000, becoming Maricopa Aircraft Inc the next month and stored here for many years now. 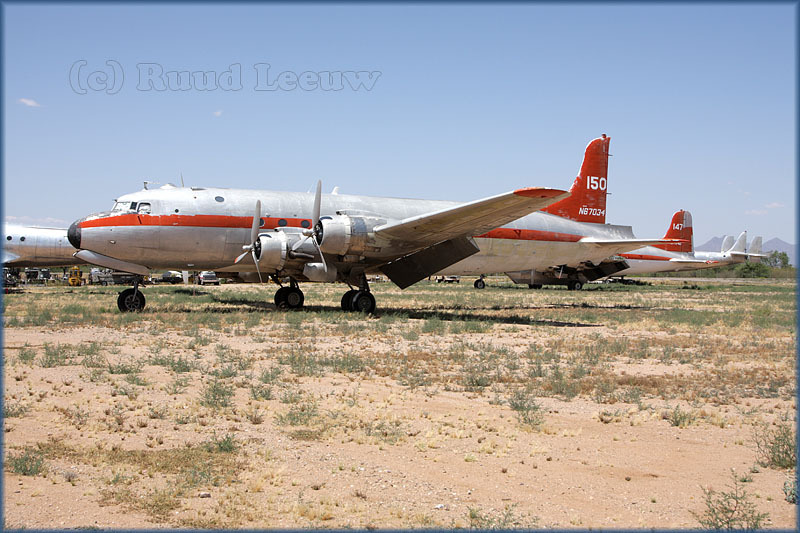 Douglas C-54D-DC N96451 (c/n 10592/323) was Central Air Services former Tanker 111. As 42-72487 this C-54D was delivered to the US Army Air Force on 27Feb45, but transferred to the US Navy on that same date and converted to C-54S. 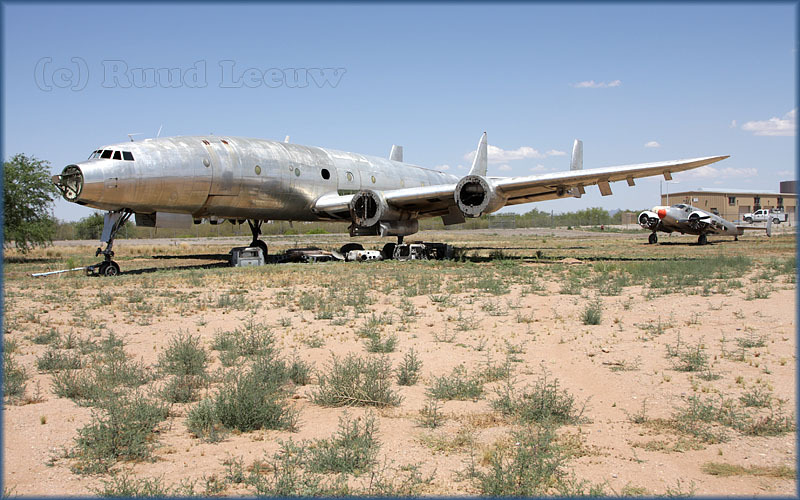 During 1970 its career ended when stored in the Arizona desert. Its civilian career started in Jan75 when Interair Leases bought it, a few months later moving to International Air Leases. N96451 was assigned for Gerald D. Wilson on 12Dec75. Stanley O. White bought this C-54 on 15Oct80, registering to Central Air Services that same date. It was registered to Maricopa Aircraft Service during Apr91 and leased back to CAS. More tired iron... This is C-54E N6816D (c/n 27368/314), airtanker 109. During its military career, with the USAF, it carried serial 44-9142. Delivery to US Army Air Force was on 29May45, but transferred to US Navy that same date and assigned serial 90412, C-54R (C-54E?). It also served the US Marine Corps. It shows a similar history as N96451 above. 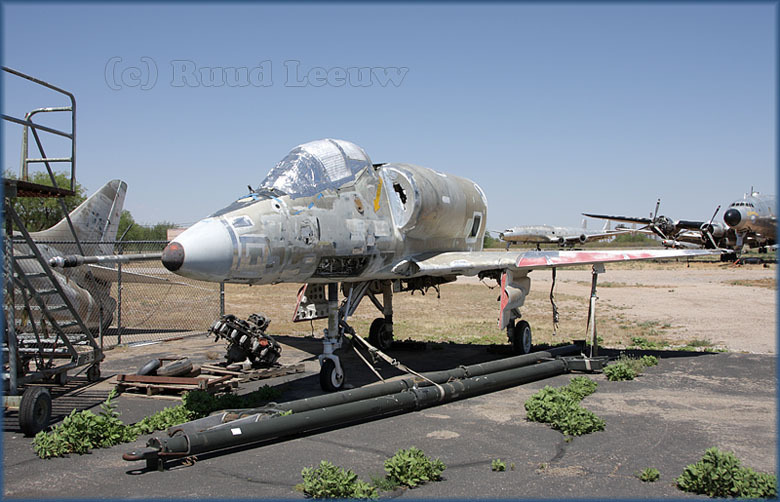 In 1970 it was stored at Davis-Monthan AFB,AZ. N96361 was assigned for Gerald D. Wilson on 12Dec75, bought by Int'l Air Leases 07Jan77, seized by US Customs 1977... See below. N6816D was registered for Services Organized 02Jul82, to Central Air Services 2 years later. Maricopa Aircraft Services bought it Jul2000 and it has led a quiet life since then! Matt Miller wrote me in Aug08: "This has been the subject of periodic debate on Air-Britain's AB-IX forum. N6816D is NOT N96361 ! Both existed at the same time. There are two separate airframes involved. Both are still on the register although neither is in operation. N96361 is listed as C-54 90412 and N6816D as C-54D-DC 44-9142. Note 44-9142 is a C-54E; I don't know if the discrepancy is significant." Compare N6816D to Jürgen Scherbarth' image of N96361, taken at Arlington,WA. in Aug.1982. 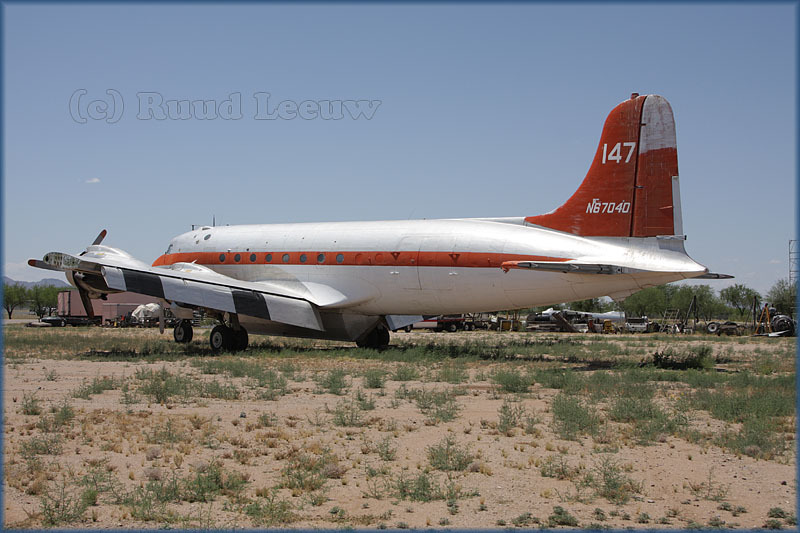 Airtanker 147 is Douglas C-54B N67040 (c/n 27232/178); it obviously had its left wing clipped: for ever? Former 44-9006 (delivered 02Dec44) was also transferred to the US Navy (serial 90392) and converted to VC-54N. In Sep67 it was stored at Davis Monthan AFB. Texas Truck Salvage Company bought it in 1975 and sold it to Robert B. Audiss Jr on 03Apr75, registering it as N67040. Central Air Services bought it on 11Oct76, it was stored at Avra Valley and Maricopa Aircraft Services became owner on 18Jun2000. This is N80232, a Lockheed P2V-7/P2-H Neptune, c/n 726-7198. Its former US Navy serial was 147948 and markings on the tail, bleached by at least 15 years of storage here, are reappearing. It is also featured in my 1993 photos and I can tell you it hasn't moved much! N9370Z is a Beech C-45H, c/n AF-780. It is of 1954 vintage and at one time wore militairy serial 52-10850. It was registered to Mission of St. Jude (of Tucson,AZ) on 21Aug98. "AF-780 C-45H 52-10850, remanufactured at Wichita by Beech from AT-11 42-37098 c/n 3478 in 1954. At some date reg'd N9370Z, Reg'd in 1966 N6638R for Dumod Corp, Opa Locka FL. 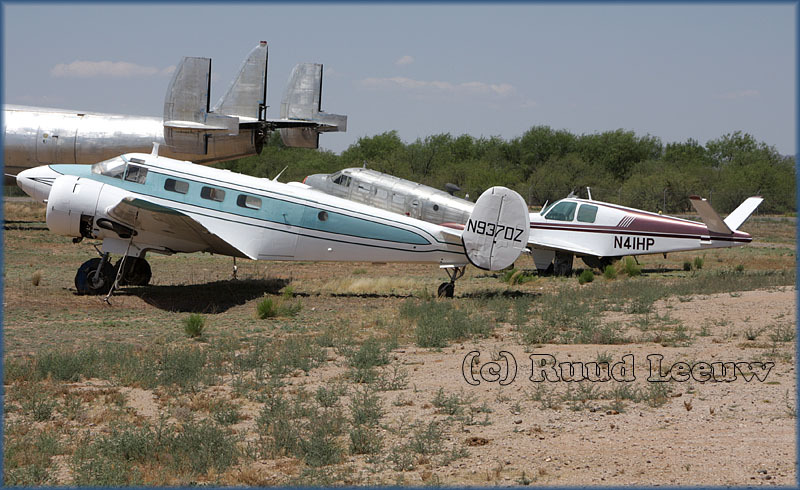 N9370Z to Mission of St Jude, Tucson AZ 21.8.98/2014." 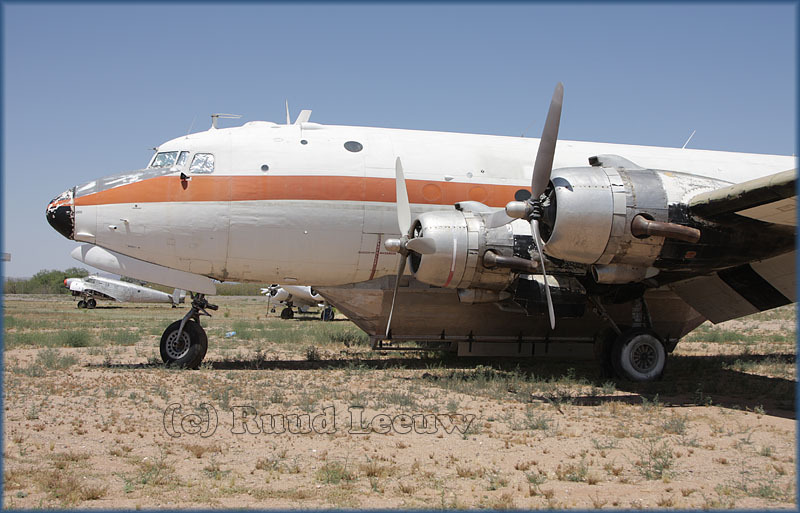 Last reported 20Mar15, no changes..
Fortunately John Bennett offered help: the Beech 18 is SNB-5P N5646, ex U.S. Navy 23793. In spite of its refined form, it did start in the military... It was delivered to US Navy in Sep53 with serial 131636, being transferred to the USAF (54-4062) in Jun58. It served with the Wyoming ANG 1963 to at least November 1971, transferring to the Air force reserve in Nov74; its military career ended at Davis Monthan AFB on 31May78 upon its arrival for storage. The SCFA acquired the aircraft in Sep.2000 and ferried it from Santo Domingo to here, to The Constellation's Group facility at Marana Regional, arriving on 07Jan01. After 18 months in the restoration effort the word had changed by nine-eleven events: a flying permit had little chance of being issued. The Constellation Group was disbanded in April 2005 after 'The MATS Connie' had been sold. SCFA sold N305CF to HARS from Australia, in early 2010, but when they acquired C-121J N4247K (in sep.2014) they lost interest in this project here. Hopefully Dynamic Aviation will restore it someday into a nice static display. Piece de resistance... The best for last! 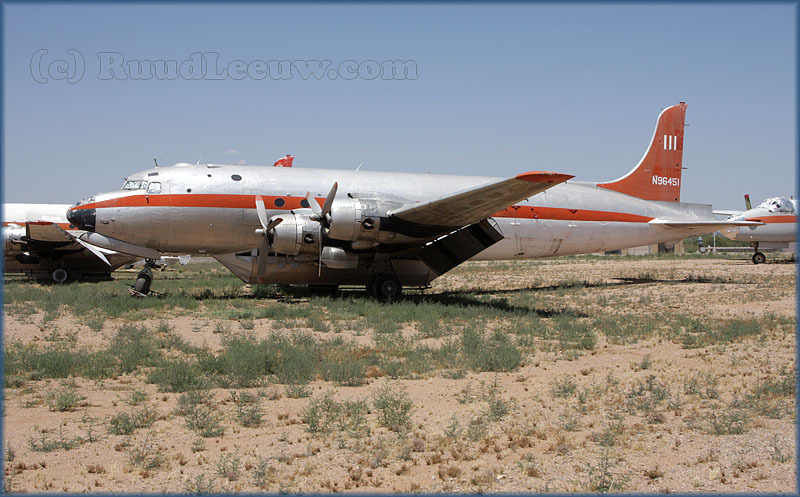 Former USAF C-121A 48-610 was converted to a VC-121A in Nov49, becoming a VIP-aircraft.. In fact it became the Presidential aircraft and was named 'Columbine II' (November 1952 to November 1954, replaced by VC-121E 53-7885). 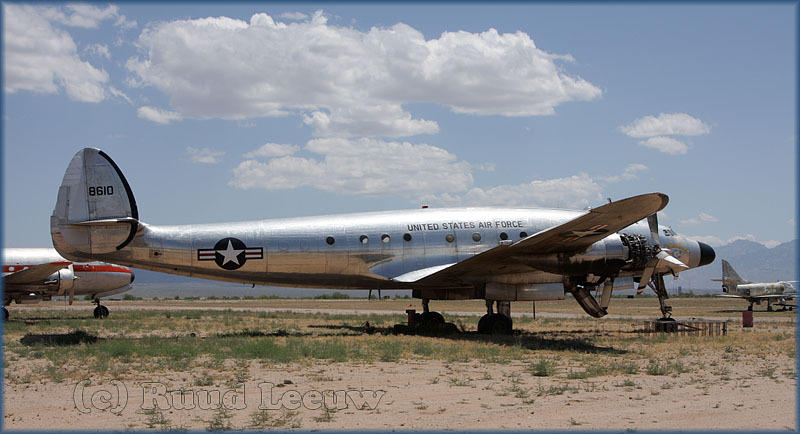 for some time it remained the backup presidential aircraft, until May 1955. It was operated by Pan American as N9907F (named "Clipper Fortuna") and served on special assignment to the Government of Thailand from May to June 1955. Returned to the 1254 ATW/89 MAW, it flew VIP missions for the remainder of its USAF career (retired & stored at Davis Monthan AFB in April 1968). 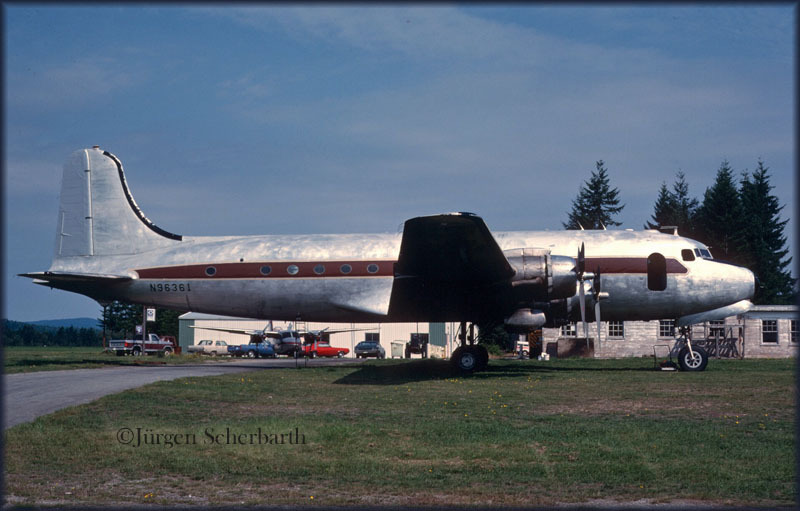 It was one of 5 VC-121A's sold to Christler Flying Service at DoD auction on 05May70 and registered N9463 (10Jul70). But it was never converted to an agricultural sprayer, but used as a source of spares for Christler's other 4 aircraft. 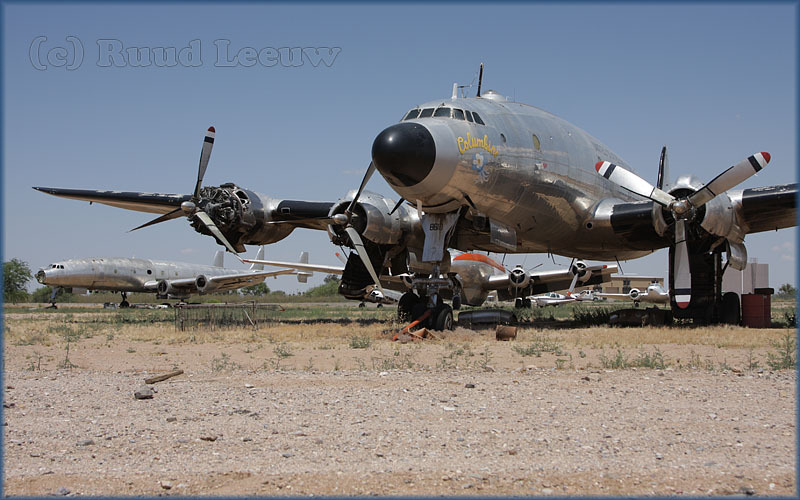 Former 'Clipper Fortuna' thus met disgrace: stored and derelict, it was reported at Desert Air Inc by the early 1980's. Recovery was at hand when (using parts from sister-ship N608AS) it was restored to flying condition by Mel Christler and Harry Oliver in 1989-90. Sold to the 'Columbine II Corporation' in Jan90, it made its first post-restoration flight on 05Apr90 and participated in a few air shows during 1990-91. Then it was stored again, at Santa Fe,NM. In Oct98 N9463 was flown to Scottsdale,AZ and offered at an auction for $1.5 million. 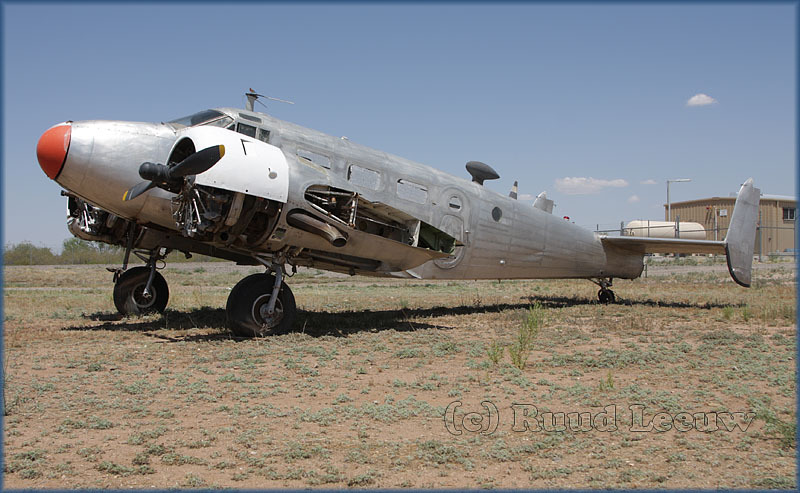 But no acceptable bids were received and the 'Connie' returned to Santa Fe. 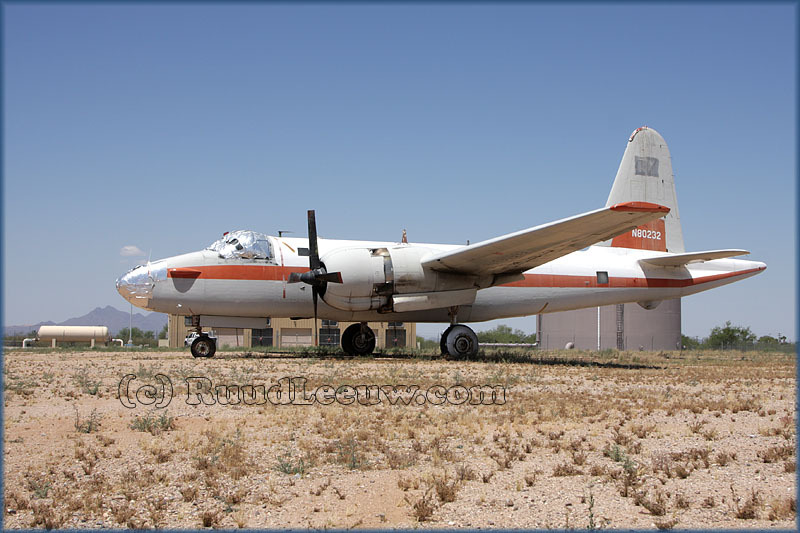 "Columbine II at Marana is being readied for a one-time-only ferry to the Eisenhower museum in Kansas, It hasn't flown for at least 7 (maybe 10?) years and was ground run briefly 3 years ago whilst I was working at ATW next door. The rudders and surfaces are all being recovered at the moment. Will let you know when I know more." Ken Stoltzfus wrote me 04Feb2015 about a plan to revive 'Columbine II': yes, she may yet fly again! See my page Photos by Friends & Guests (41). "Columbine II, the first presidential Air Force One, will be under new ownership this summer as a restoration process gets under way in Arizona. 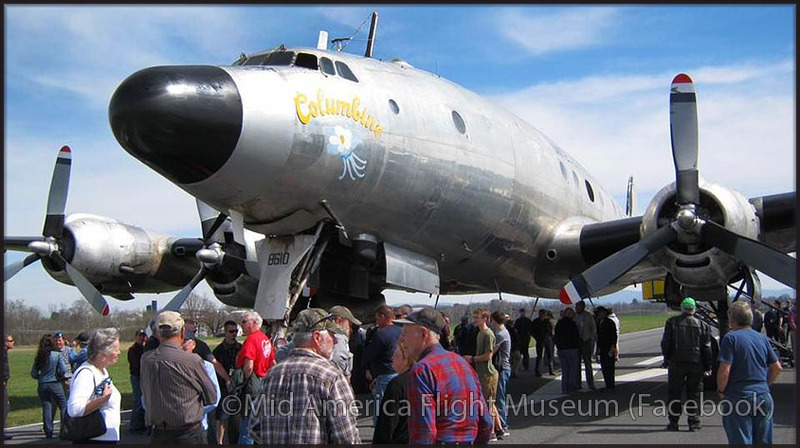 Dynamic Aviation of Bridgewater, Virginia completed its due diligence this week and decided to proceed with the purchase of the 1948 Lockheed C-121A Constellation used by President Dwight D. Eisenhower. Owners Harry Oliver and Lockie Christler — son of the late Mel Christler, who had owned it for years — will sell the Connie to Dynamic founder Karl. D. Stoltzfus Sr. 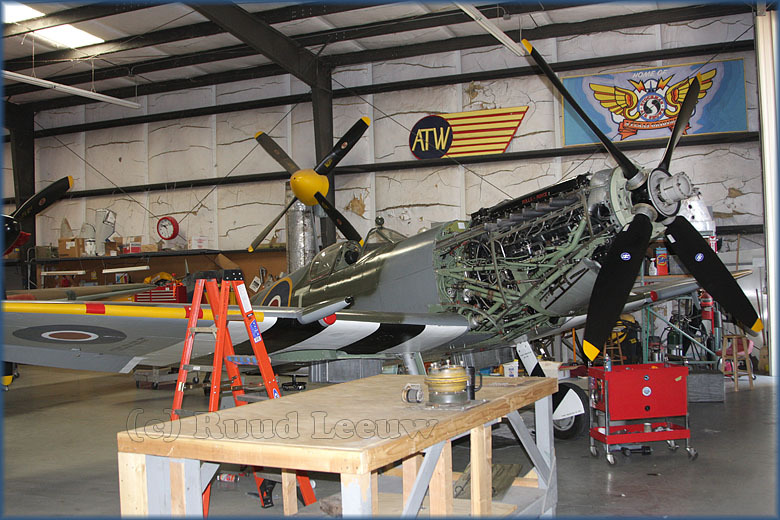 Among the project’s other supporters are Mid America Flight Museum of Mt. Pleasant, Texas. Dynamic wants to make the aircraft airworthy and fly it home as a certificated aircraft rather than on a ferry permit. No completion date has been set." And then it finally flew! On saturday 19Mar2016 Columbine II took to the skies again, its first flight since the recent restoration started! 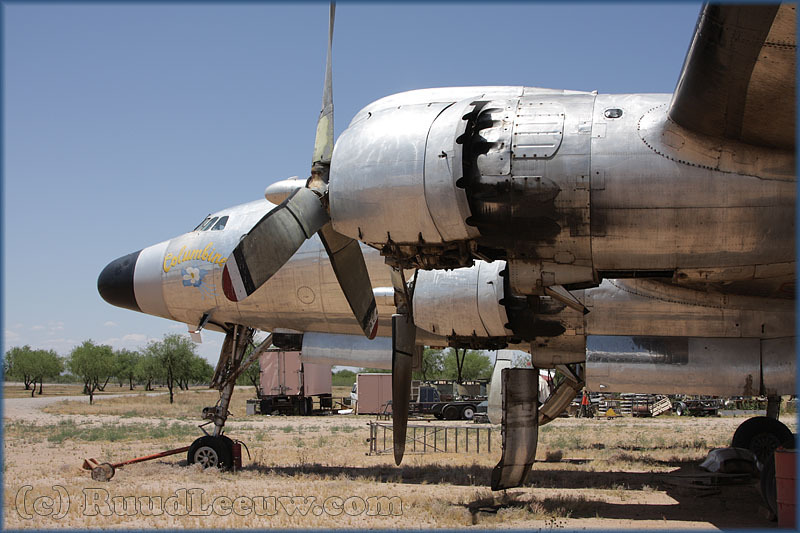 "In the stifling, mid-day heat of Saturday, March 19th the hard-earned dreams of a year-long effort saw the first post-restoration flight of the Lockheed VC-121A Constellation known as Columbine II. As the graceful, silver bird rumbled into the sky, a huge cheer rose up from the small crowd gathered to watch at the Marana Air Park in Marana, Arizona. The Connie was in the air for roughly an hour on that first flight as the crew evaluated her performance." Columbine II then departed Marana Regional Airport monday morning (21Mar16). Accompanied by Mid America Flight Museum B-25J 'God and Country' and a Dynamic Aviation King Air she flew to Mt. Pleasant,TX. From there she will continue to Bridgewater,VA for further restoration. From www.conniesurvivors.com : Columbine II Completes Final Leg of Flight to Bridgewater, Virginia – March 23, 2016. Delayed at Mt.Pleasant for a repair on a fuelleak it arrived early afternoon at its destination, and its new home, at Bridgewater,VA. Well done!